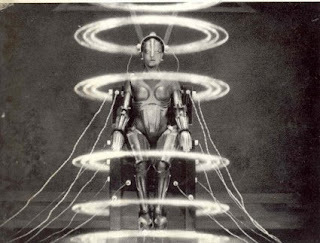 After the success of his “Niebelungen” films (1922-24), director Fritz Lang was given virtual freedom to make Metropolis (1927). The film was comple ted after eighteen months and the participation of 36,000 people – at unprecedented expense. 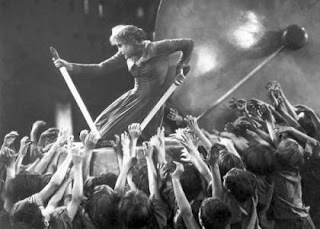 Advertised as the “costliest and most ambitious picture ever screened” in Europe, it opened in Berlin on January 10, 1927 as a major social event, attracting cabinet members, diplomats, and literary and social figures alike. Despite the intense interest it stirred, it failed to recoup its investment. From the beginning reviews were mixed, but reactions were invariably strong, whether favourable or not. It has been criticized for its insufficient development of characters, naive attempt at social comment, and simplistic melodramatic movement of plot. True, there are moments when one is reminded of Flash Gordon, but as a testament to one of the most fertile imaginations nurtured during a time of rarely paralleled creative outpouring, it is an important, if flawed, example. Its unmistakable virtue lies in its visual presentation, especially its grandiosely conceived sets – certainly a landmark in German studio production. The settings, particularly the workers’ homes, are stylised into mere forms with black rectangles for windows. A number of these were models, which were combined with live actors through the Schufftan process. Invented by photographer Eugene Schufftan, it used a camera with two lenses which focused two separate images onto a single strip of film; this allowed actors and models to be recorded together without resorting to double exposure or laboratory work. The designs are Expressionistic, but the architect in Lang rebelled against the surface distortion and linear anarchy of Caligari’s use of the style. Instead, his settings are solid and substantial, extending in more than two dimensions. Their design is regular, controlled and organised, dwelling on simplicity rather than clutter. A painter’s eye for composition and staging is again revealed in Lang’s direction. Any selection of the best examples tends to be determined by memory and subjective inclination, but particularly effective are the bearing of injured workers in silhouette past Frederson, the shots of children running along the street with the water’s edge flowing a few seconds behind them, and the tent of electricity surrounding the robot during the creation scene. Only in Die Niebelungen, and to a lesser extend in Der Müde Tod, did Lang allow his painter’s eye and architect’s pen to create as much excitement.